Hastings United Football Club will contest its first two home pre-season friendlies over the coming week, both against higher grade opposition. Bostik League South East Division side Hastings will entertain Premier Division teams Kingstonian tomorrow (Saturday, kick-off 3pm) and Lewes on Tuesday night (kick-off 7.45pm). Hastings manager Chris Agutter said: “I think The Pilot Field should be a fortress, a difficult place to come, and it’s important the players get used to playing on it. “It’s the dimensions of the pitch which are the big thing because it’s notoriously one of the widest pitches in the league. It’s important we have every opportunity to use that width and take full advantage of it. “I don’t think Kingstonian will be far off challenging for promotion. They’ve got some real quality and it will be a different type of test. So far we’ve had the majority of the ball and been very dominant, but we’ll be asked to defend an awful lot more. I’ll definitely learn more against Kingstonian. Admission for the home friendlies is £6 for adults, £3 concessions and free for under-16s. The Lewes match is an all-ticket affair and tickets must be purchased in advance. They are available until midday on the day of the game from the club secretary’s office at The Pilot Field (Monday-Friday 9.30am-12.30pm), The Flower Shop at The Conquest Hospital, Smart Property in Havelock Road, online at www.hastingsunited.com and the club shop during tomorrow’s game. Hastings also have an away game against Rochester United on Monday night. Agutter’s charges have contested three matches against Southern Combination League Premier Division opposition over the past week. 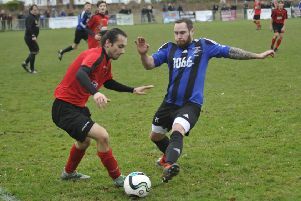 Hastings produced another good performance to win 1-0 against Little Common on Saturday. Jack Dixon scored the only goal, while Kelvin Ogboe and Sam Cruttwell performed particularly well in a match played on the 3G pitch at Bexhill College. They then triumphed 2-1 away to Newhaven on Tuesday night. Ogboe and Daniel Ajakaiye got the goals, while Adam Lovatt had a terrific game in midfield. The following night Hastings were beaten 1-0 away to AFC Uckfield Town in another useful pre-season run-out. Hastings fielded 11 first team players, two triallists and two youth team players against Newhaven, and the vast majority of first team players played 90 minutes. It was a similar approach against Uckfield. In all, six academy players made their first team debuts over the two matches. Agutter says one of the triallists has done particularly well and he is hoping to get the player signed up, possibly over the next couple of weeks. He plans, however, to trim down the squad slightly from its present size of 22 before the start of the league campaign on August 11, saying there will be players sent out on loan or released. Agutter has this week been speaking to a player who has been released by Maidenhead. He previously approached the player partway through last season, but the player decided to remain at the club where he was at the time. Sam Beale is being nursed back after twisting his knee in the opening friendly, Tom Vickers picked up a slight quad injury against Newhaven and Alex Smith - who the club is handling very carefully as he returns from long-term injury - is around a week from being available for selection.